2017 Torrot S12 SIC58. Picture credits - Torrot. Submit more pictures. The motorbike is the result of a project carried out in collaboration with �Marco Simoncelli Foundation� ant Torrot, who is focused to use its Know-how, to help children to realize their dream to compete, like real pilots on road circuits, offering the maximum safety guaranteed by the Tradition and Experience of Torrot Brand. Comments: 48 V LiNiCoMn 8.8Ah battery. Max rider weight 40 kg. Ask questions Join the 17 Torrot S12 SIC58 discussion group or the general Torrot discussion group. 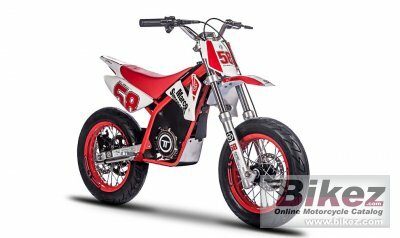 Get a list of related motorbikes before you buy this Torrot. Inspect technical data. Look at photos. Read the riders' comments at the bike's discussion group. And check out the moped's reliability, repair costs, etc. Show any 2017 Torrot S12 SIC58 for sale on our Bikez.biz Motorcycle Classifieds. You can also sign up for e-mail notification when such mopeds are advertised in the future. And advertise your old MC for sale. Our efficient ads are free. You are also welcome to read and submit motorcycle reviews.